Select a slider that matches the one you are removing. The numbers that are printed on the nose of the slider indicate what size is needed. The Zipper Repair Kit by GEAR AID offers an assortment of zipper sliders and top stops, as well as a sewing kit and a seam ripper to help with replacing worn zipper sliders. STEP 1: Begin by removing the old zipper slider off the zipper. 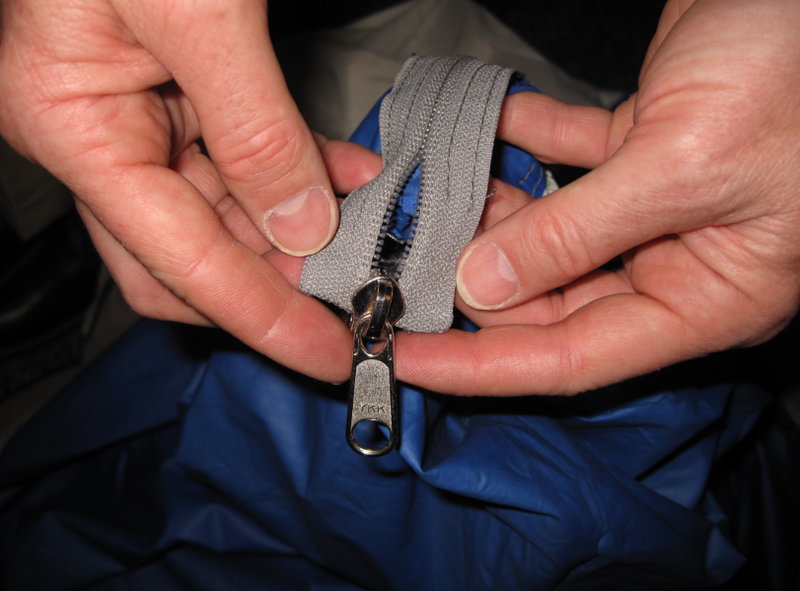 Advance the slider to the top of the zipper and remove it. 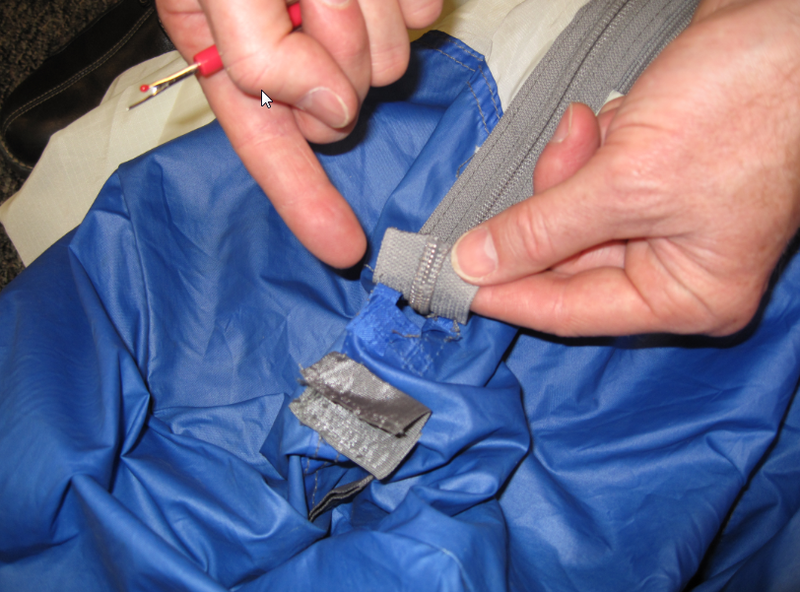 You may need to use the seam ripper to remove fabric stitching around the top of the zipper to access it. 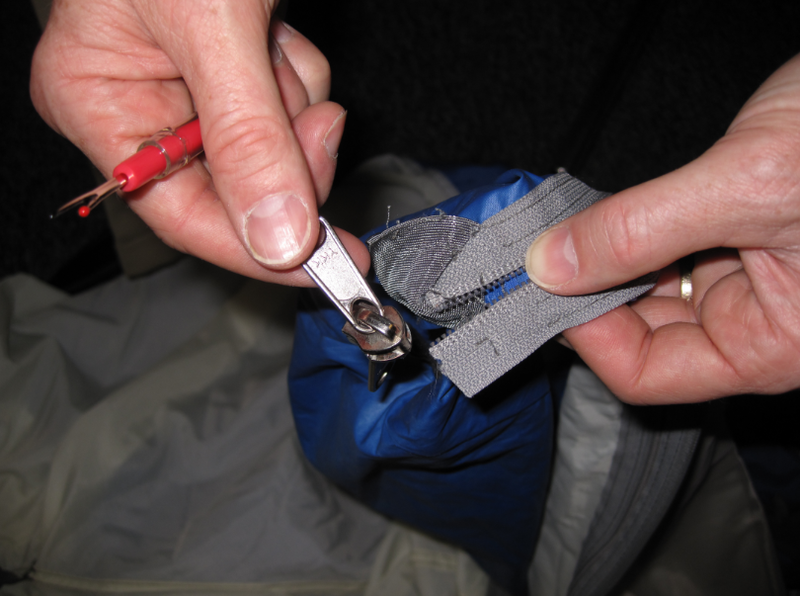 STEP 2: If there is a zipper stop present on the top of the zipper, remove it with cutting pliers or nippers. 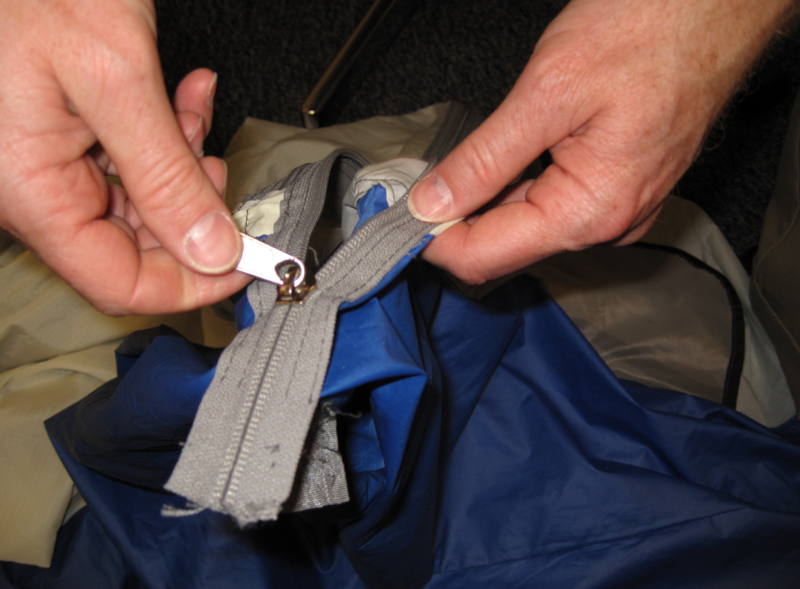 STEP 3: Once you’ve removed the old zipper slider, simply slide a new one on from the top of the zipper. Make sure the zipper slider “nose” is facing up towards the top of the zipper. STEP 4: Crimp a new zipper top stop onto the top of the zipper with pliers. 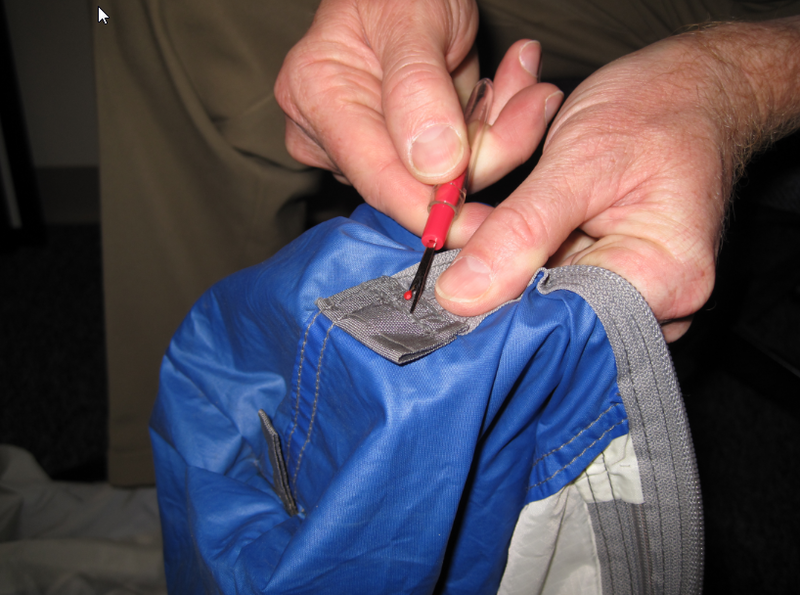 STEP 1: With a seam ripper, remove stitching around the lower end of the zipper. STEP 2: If present, pry off the metal stop at bottom of the zipper; be careful not to tear the fabric at the base of the zipper teeth. 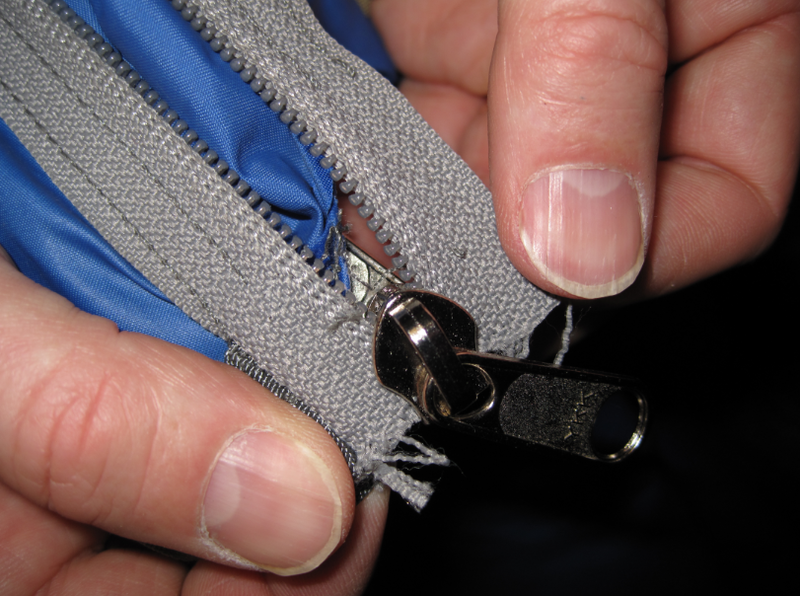 Remove old zipper slider. STEP 3: Take new zipper slider and guide zipper teeth into the top grooves of the slider, pushing them through to the bottom. Use a pin if needed to work the zipper hem through. STEP 5: Pull slider up until locked track teeth appear at the bottom. STEP 6: Sew a new stop at bottom of zipper tracks with needle and thread. NOTE: For dual-slider zippers repeat process on the other closed end of the zipper opening to replace the second slider.